How does battle strategy play a key role in determining the outcome of a war? 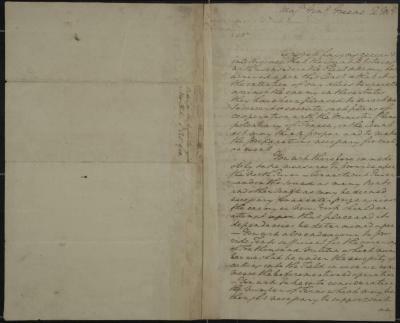 Letter from George Washington to Major General Greene about preparations for British expedition against New York, October 6, 1779. What does Washington mean when he asks for an enterprize against the enemy? Divide the class into two groups both representing the Continental Army. Each group creates a battle strategy: 1) Take General Washington’s advice to ready troops for the ‘major enterprize’ in New York, and contact Major Ayres or, 2) Prepare to take position at another location, because the message to Major Ayres was intercepted and the militia will not have reinforcement. Robson, Eric (1966) The American Revolution in Its Political and Military Aspects 1763-1783, W.W. Norton Company, London. Congress having receiv’d intelligence that the Count D’Estaire with a considerable Fleet and Army has arrived upon this coast and that it is the intention of our allies to operate against the enemy in these States they have been pleased to direct me to concert and execute such plans of co-operation with the Minister Plenipotentiary of France, or the Court as I may think proper and to make the preparations necessary for such an event. You will therefore immediately take measures to provide upon the North River-Connecticut River and in the Sound as many boats and other craft as may be deemed necessary for an enterprize against the enemy in New York should an attempt upon that place and its dependancies be determined upon. You will also endeavor to provide tents sufficient for the covering of ten thousand militia which number we shall be under the necessity of calling into the field in case we commence the before mentioned operation. You will take into consideration the number of teams which may be thought necessary to support such an operation and to bring forward the military and other there essential to the expedition. I approve your plan of calling upon Maj’r Ayres in Phil[adelphia] to employ as many ship carpenters as can be found willing to engage in the expedition. They will hasten the previous preparations of the boats as well as aid some other operations in the course of the base. You will generally make such preparations in your departm[ent] as such an operation as the before mentioned may seem to require having constantly in view the necessity of being in readiness as s[oon] as possible.